The first comprehensive account of Azerbaijan's rich and tumultuous history up to the present time. Product weight is 1.33 lbs. Definitely, Audrey Altstadt made an extensive work for such profound book on Azerbaijan. Her exploration of Azerbaijani identity and the development of the statehood based on a number of sources as well as her own analysis. The book mainly focuses on the period of from the end of the XIX century to the collapse of the USSR, and thus it covers mostly the Soviet period. It must be read by anyone who start studying Azerbaijan and the region of the South Caucasus as a whole. arf "arf" (Canada) - Se.. If you don't know much about Azerbaijani Turks and their identity then I think this is a decent book in order to understand them. If you want to understand Azerbaijan and the Caucasus then just stay away. Buy something else. I really wanted to learn about Azerbaijan but this book didn't explain the Albanian peoples history very well, like what happened to them, are there any left. They probably assimilated to Turkish culture but its clear. Secondly, the WWI and 1st Republican period is very hazy. I didn't u..
O. Avedikyan - See all .. The central theme of Azerbaijani Turks' political life is their relationship with the Russians. 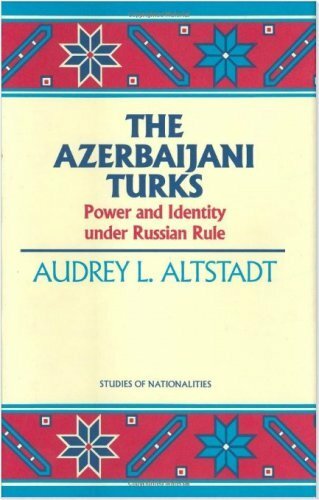 In "The Azerbaijani Turks: Power and Identity under Russian Rule," the author examines this theme through the study of Imperial and Soviet Russian central government policies and the Azerbaijani Turks' responses to them.The origins of the Azerbaijani Turks--the correct name of the ethnic citizens of Azerbaijan--are covered here only briefly. Using Russian and Azerbaijani Turk contemporary sources that provide a b..
Mike Cunha (Boston) - S..